Earnings season is in high gear, and investors can expect several major corporate earnings results on Wednesday. Before the opening bell, Abbott Laboratories ( ABT ), Comcast ( CMCSA ), Kimberly-Clark ( KMB ), Procter & Gamble ( PG ) and United Technologies ( UTX ) will release their earnings reports. Analysts are expecting Procter & Gamble to report earnings of $1.21 per share on $17.16 billion in revenue. Comcast is expected to earn 62 cents per share on $27.17 billion in revenue, and United Technologies is anticipated to have earned $1.52 per share on $16.87 billion in revenue. After the market close, Canadian Pacific Railway ( CP ), Ford ( F ), Las Vegas Sands ( LVS ), Texas Instruments ( TXN ) and United Rentals ( URI ) will round out earnings on Wednesday. Ford is expected to report earnings of 30 cents per share on $37.59 billion in revenue, according to analysts polled by Bloomberg. Additionally, Las Vegas Sands is anticipated to have earned 85 cents on $3.53 billion in revenue during Q4. Wall Street is growing increasingly pessimistic on earnings. Jonathan Golub, Credit Suisse’s chief U.S. equity strategist, echoed Wilson’s sentiment. “As we look at the data, it’s hard not to notice a deceleration in earnings and economic growth. 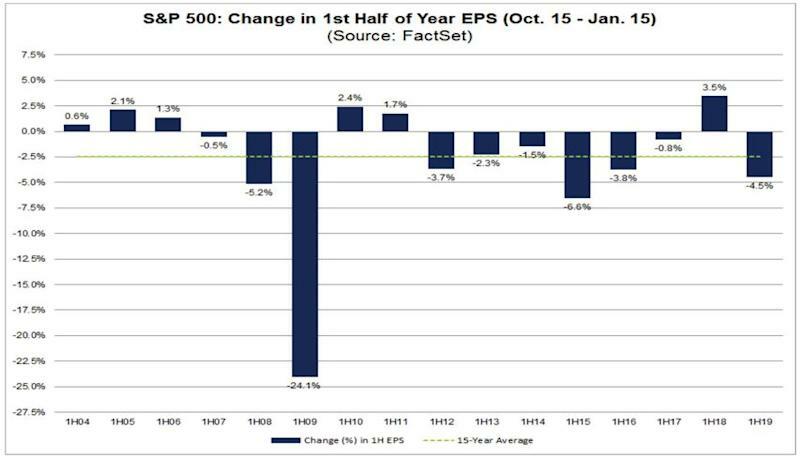 Perhaps the most extreme example of this trend is the falloff in consensus EPS estimates. While our work indicates that analysts are likely too harsh in their 2019 numbers, it nonetheless confirms the downward trajectory,” he said in a note to clients on Tuesday. On the economic data front, market watchers can expect MBA mortgage applications data for the week ending January 18, FHFA House Price Index month-on-month for November, and the Richmond Fed Manufacturing Index for January. And here’s what caught markets correspondent Myles Udland’s eye . This year will not be great for the economy, according to corporate America. On Tuesday, Stanley Black & Decker ( SWK ) and Johnson & Johnson ( JNJ ) became the two most recent multinational giants to give a downbeat outlook for the year ahead. Johnson & Johnson offered 2019 earnings guidance that was roughly in-line with the Street — saying adjusted earnings this year will fall between $8.50-$8.65 against forecasts to earn $8.61 per share, according to data from Bloomberg — but sent the broader healthcare sector lower on Tuesday after guiding to sales that were below estimates, with revenue expected to grow in a range of just 0%-1% in 2019. And these warnings for 2019 results are just the latest in a round of downbeat outlooks offered this month from the likes of Apple ( AAPL ), Ford ( F ), Sherwin-Williams ( SHW ), PPG ( PPG ), and American Express ( AXP ), among others. So as we head into the teeth of fourth quarter earnings season, the way that corporate America is looking at the economy this year and beyond is becoming clear — things are not good. As we noted last week on The Final Round , analysts have pared their forecasts for the current quarter substantially and the outlook is now worse than the historical trend, as analysts tend to grow more constructive during earnings season because companies beat the guidance they lowered in the run-up to their quarterly report. And FactSet noted last week that earnings forecasts for the first half of 2019 have been slashed by 4.5% over the last three months, the most since the post-oil crash revisions in 2015 and the second-largest reduction in analysts’ forecast for the first half of a year since the financial crisis. The market action at the end of 2018 reflected investors pricing in, at a minimum, a more uncertain outlook than what had been presented to investors in recent years. The question at the beginning of trading this year, then, is just what news had been accounted for by the market. Considering the solid run we’ve seen in stocks to begin the year, a surface-level reading suggests more bad news was priced in last year than the market believes is warranted. Some analysts, however, believe this rally will eventually be tested amid the continuing onslaught of negative news. “A modest earnings recession got priced in late December but that's questionable now; yet earnings revisions are plummeting on worse sector breadth than during 2016's earnings recession,” said Mike Wilson at Morgan Stanley on Tuesday. Heidi Chung is a reporter at Yahoo Finance. Follow her on Twitter: @heidi_chung .